Martha Pitkin and the Sandusky Chapter, D.A.R. James Monroe was born in 1821 in Connecticut to Quaker parents. He graduated from Oberlin College in 1846, and he earned his theology degree from Oberlin College in 1849. 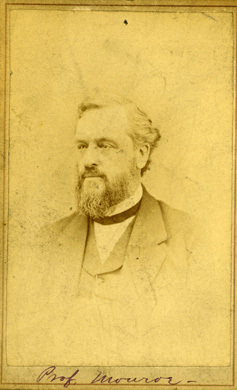 Monroe taught at Oberlin College from 1849 to 1862. From 1856 to 1859, he served in the Ohio House of Representatives, and was in the Ohio Senate from 1860 to 1862. From March 1871 to March 1881, James Monroe was a Representative to the United States Congress. According to the book James Monroe: Oberlin's Christian Statesman and Reformer, 1821-1898, he was a minister in Sandusky, Ohio during the winter of 1848-1849. James Monroe was known for his strong abolitionist views. His former home can be toured in Oberlin, Ohio, where the story of his abolition activities is told. Mrs. John Mack donated the portrait of Professor Monroe to the Sandusky Library Archives Research Center. Sandusky had many ties to Oberlin throughout the years. Former Sandusky resident, Francis Drake Parish was a trustee of Oberlin College from 1839 to 1878, and longtime newspaper editor, I.F. Mack was a graduate of Oberlin College.